Our desire is to consistently provide the most conservative, long-lasting and beautiful dental restorations. 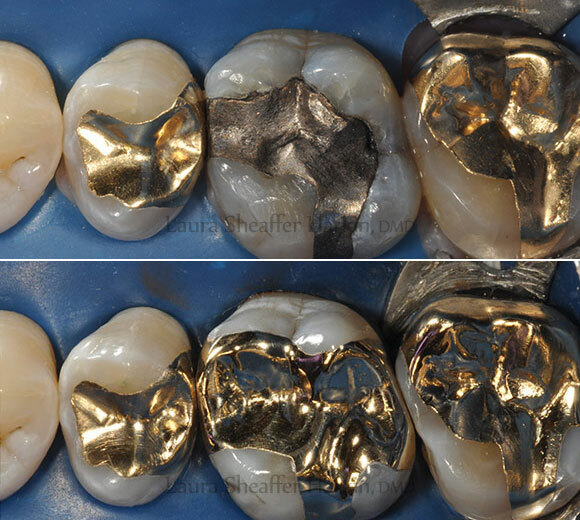 Our gold restorations truly are the gold standard of restorative dentistry. This precious metal has the least reactivity of all the metals used in dental restorations, and it lasts longer than any other material used to restore teeth. Tooth enamel is the hardest substance in our bodies, as it contains the most minerals. Gold coexists wonderfully with enamel. This conservative treatment requires less tooth reduction when preparing the tooth for restoration. Gold wears at a rate similar to that of your natural teeth. Gold is a relatively soft material, and it expands and contracts with the same coefficient as enamel. The seal between the gold and the tooth is far superior to any other material used in restorative dentistry. It is more resistant to fractures than other materials. The gold restorations are handmade by our laboratory technician. Once placed in the tooth, the gold is burnished and polished so that it’s virtually seamless. While we generally recommend gold restorations on back teeth, it is important to note that we can frequently conserve the outward-facing tooth structure to obtain a chameleon effect. The warm hue of gold inlays and onlays beautifully complements the natural coloration of tooth structure. Dr. Laura Harkin began pursuing gold restorations thanks in part to the benefit of following multiple generations of patients in her practice. The historical perspective of seeing restorations completed by her grandfather, Dr. John Sheaffer Sr., and her father, Dr. John Sheaffer Jr., gave Dr. Harkin an opportunity to evaluate the longevity of dental materials and procedural designs. Dr. Harkin found that gold restorations allow for such conservative treatment that they often make it possible for patients to keep their natural tooth for 50 years or more. Dr. Harkin pursued additional training at the Tucker Institute in Seattle, Washington, and she continues to improve her clinical skills for goldwork through participation in a local R.V. Tucker study club.